On Lily Sanderson's eighteenth birthday she'll become just a girl--still a mergirl, true, but signing the renunciation will ink Princess Waterlily of Thalassinia out of existence. That leaves plain old Lily living on land, dating the boy she loves, and trying to master this being-human thing once and for all. Now that Lily and Quince are together, mer bond or not, she's almost content to give up her place in the royal succession of Thalassinia. But just when she thinks she has everything figured out, the waves start to get rough. Lily's father sends a certain whirlpool-stirring cousin to stay with her on land. What did Doe do to get herself exiled from Thalassinia and stuck in terraped form, when everyone knows how much she hates humans? And why why why is she batting her eyelashes at Lily's former crush, Brody? The sea foam on the raging surf comes when a merboy from Lily's past shows up--Tellin asks Lily for something that clouds her view of the horizon. There's a future with Quince on land, her loyalty to the Kingdom in the sea, and Lily tossing on the waves in the middle. Will she find a way to reconcile her love, her duty, and her own dreams? 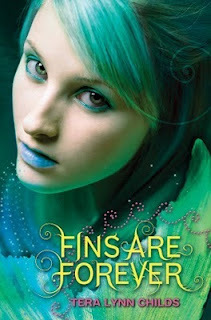 Overall i enjoyed the second book in the fins series, Fins Are Forever, but i definitely had mixed feelings while reading it. I loved everything with her and Quince, but i hated the parts with Tellin. I don't enjoy love triangles so Tellin really really drove me insane. Well, really Lily drove me insane, because she is the one with the mixed feelings, but you know what i mean. Lily really bothered me a lot during Fins Are Forever. I really liked her in Forgive My Fins, but this one she was just too scatter-brained. For example i am a person who is big on scholastic things, and when she kept missing her appointment with the woman from the college she wants to go to it drove me insane. I wanted to jump in the book and shake her. I did like the story line a lot though and just decided to deal with Lily's craziness so i could still enjoy the story. Also i didn't care for the ending. I think it had something to do with me just finishing the first book in The Hunger Games so im used to bad things happening. But when the ending game in this book i was just a little distraught that it ended on such a positive, everything got fixed ending. I really think it was because of The Hunger Games so i can't truly trust my opinion about it. I really did like the book. I loved the story line and i loved all the parts with Quince. There were a few things i didn't like about Fins Are Forever (the ending, Lily's scatter brain, and Tellin) which is the only reason im giving it three stars. I think if you are in a happy go lucky mood this novel will be great, but if you are looking for something with a little more bite to it, this isn't going to do it for you. I will continue with this series, though, because i do really enjoy it and i really like Tera Lynn Childs writing style.